Ebay bargain of the day: "A great wooden vintage cabinet"
One thing I've learned this week, between the new issue of Lonny hitting my inbox and a fresh Vogue Living hitting my mailbox, is that Shabby Chic appears to be having a mini revival. 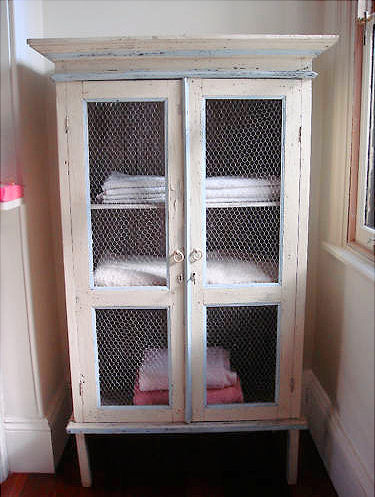 Which brings me to my dear friend S, who is selling this beautiful vintage "shabby chic" cabinet on ebay, and it's too cheap (current price is AUD$91) not to share with you all. Oh, and it's huge. PS Pickup is from Balmain, in Sydney's inner-west. PPS Ends Wednesday lunchtime (AEST), so be ka-wick! Looks great but no room for anything bigger than a pin in our house at the moe.. We are culling - seriously so, due to our move to Sweden next year..